I used Rohu fish with bone in this recipe.If you want, you can use any big fish or fish fillet. Using sugar will not make the dish; sugar is used to enhance flavour. Enjoy the flavour of Bangladesh. 1. 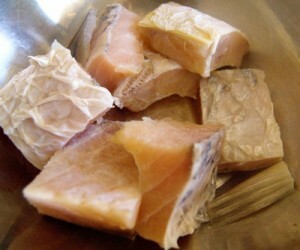 You can check on picture to cut ruhi fish into about 1″ pieces and add turmeric and ½ teaspoon salt with fish. 2. Heat the pan with 2 tablespoons oil on medium high and add fish pieces. 3. Fry it for 2-3 minutes and take out fish pieces for oil. 4. In same pan add rest of oil and sliced onion; fry onion till it becomes transparent and add rest of spices and salt. 5. Cook it till oil is separated and add ruhi fish pieces. Cook about 2-3 minutes and add 2 tablespoons of water. 6. Cook it on medium heat till fish becomes tender and stir occasionally. 7. Add sugar, lemon leaves and lemon juice and cook it under closed lid 2 minutes. 8. Check the salt and add coriander leaves . 9. 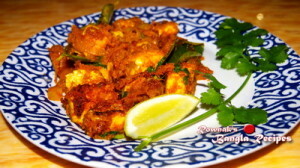 Remove from heat and serve Lebu Patay Rui Mach / Spicy Fish with Lemon Leaf with rice. I wish I was your neighbor, the pic and recepies are making my mouth water. I wish that i have Bengali neighbor. Most welcome. During partition my grandfather moved out to India. 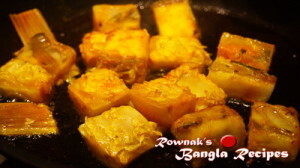 But we grew up with the typical great flavor of food of Bangladesh. Your blog always take me back to my childhood days. It makes me very very nostalgic. Surprisingly like the other fan of your great blog, I was also thinking to shift next to your residence. If not to eat but to be blessed by the aroma of great food you cook. I feel honoured to make you nostalgic and you are most welcome to become my neighbour or guest in my house. Thanks.